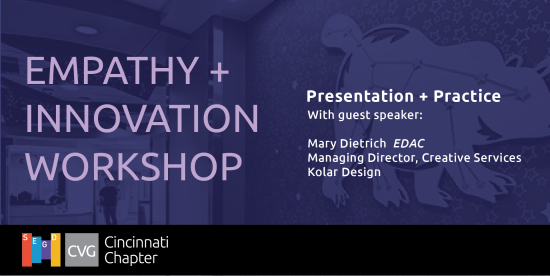 Members and friends of SEGD Cincinnati: Join us for this one-of-a-kind workshop experience! Gather over lunch and get inspired through presentation and practice while we dig a little deeper into the impact of Empathy and Innovation in design. Mary Dietrich of Kolar Design will be speaking to our group about measuring the success of empathy through design and will share some of the learnings that were quite unexpected as a result. This abridged talk comes from her full presentation at the Eighth Annual Patient Experience: Empathy + Innovation Summit that took place May 22–24, 2017, at the Cleveland Convention Center in downtown Cleveland, Ohio. "As practitioners, we are challenged by our clients to solve complex wicked problems. Most often, these problems are muli-factored and may or may not be self-evident. Regardless, they require that we understand/explore the root cause of the issue before landing upon a solution. 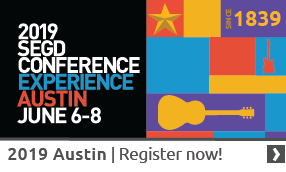 This session explores paradoxes that the Kolar team has encountered through work within the healthcare space in hopes of providing inspiration for where to unearth the root of your client’s next wicked problem." As a extra engagement piece, our entire group will practice empathetic listening during a live, breakaway session in small groups, using the "Questions & Empathy" card deck produced by Sub Rosa. This free event and lunch is provided by our host, BHDP Architecture.